Margaret Cho is a versatile genius as she is not just an actress but something more than that. She, in fact, does the toughest part of acting which is making people smile. This great comedian was born on 5th December in the year 1968. However, she is more than a talented person as her talents can be considered as uncountable. She is a singer, songwriter, designer and author too which together have fetched fame for her. Being a designer, it’s natural that she also possesses an obsession for tattoos which can beautify one’s figure. It would not be an exaggeration if it’s told that she has a craze for tattoos and this reason, she has designed them all over her body. 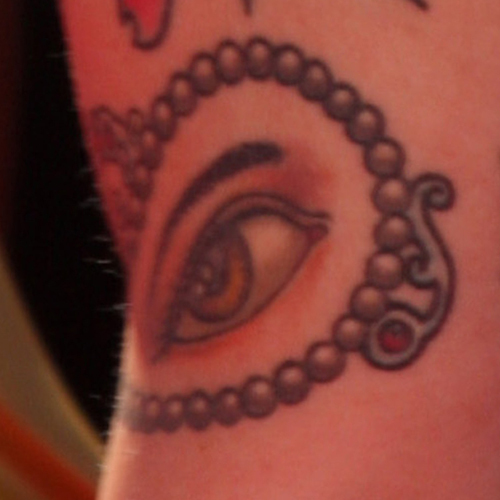 Among numerous tattoos, one of the fines is an eye tattoo on her right arm. The eye is surrounded by some beads used as jewellery in the Victorian Era. According to Margaret, it’s a lover’s eye. This lady also obtains a crane tattoo designed as a Japanese style on her right thigh. There are some cherry blossoms surrounding the crane. Several peony tattoos are also found on her body which look beautiful.